After over an hour of talks, the three leaders went out to reporters for a protocol photo shoot before continuing. 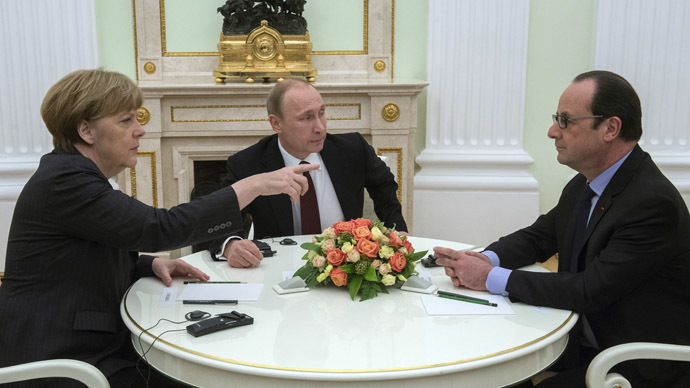 According to Kremlin spokesman Dmitry Peskov, the talks are being held without any delegation members. On Thursday, Hollande and Merkel held a meeting with President Petro Poroshenko in Kiev. It followed the Ukrainian leader’s talks with US Secretary of State John Kerry who arrived in Kiev to discuss the possibility of providing lethal aid to Ukraine. He said US President Barack Obama will take the decision next week. On Thursday, however, the White House admitted that possible military assistance from the US to Ukraine could increase bloodshed in the region. The same idea was echoed on Friday by the British defense secretary. Media reports earlier suggested that Hollande and Merkel’s visit to Moscow was a snap decision made without consulting Washington. After Hollande said on Thursday that“together with Angela Merkel we have decided to take a new initiative,”French media hinted that the decision to visit Moscow came as an attempt to present a viewpoint on solving the Ukrainian crisis that differs from the US one. US & Europe divided over Ukraine? There is clearly a disagreement between Washington and Brussels over arming Ukraine, says Nicolai Petro, Professor of Politics at the University of Rhode Island. Before arriving in Moscow, Merkel had expressed uncertainty about the result, while Hollande said he hoped an agreement would be reached. “Of course there is a difference in the position. There is also difference in the position of the EU as a whole because there are different economic interests. France has always been largely independent in NATO. So their position historically is very different than the position of Germany,” Ann Van Densky, political commentator for EU Reporter magazine, told RT. A number of the NATO member states have officially refused to provide Ukraine with weapons, among them Germany, France, Britain, Denmark, the Netherlands, Finland and the Czech Republic. “NATO is flexing muscles. We hear the Republicans’ debate in Washington and they use very strong language and they are very eager to supply Kiev forces with weapons. Within this context Europe tries to promote its interest,” she said, adding that there is still no "profound understanding [in Europe] that the peace can not be imposed without inclusion of people of Donbass," as a long lasting solution can only be found if these people's interests are heard. "Let's not forget that federalization of Ukraine which is possible now won't be possible very soon," she said. However, NATO attempted to lay the blame for the situation in eastern Ukraine on Russia though Moscow has long rejected allegations of its troops being engaged in the conflict. “I say it every time: if you are so sure in stating that, confirm it with facts. But no one can or wants to provide them,” Russian Foreign Minister said in January. Speaking about a political solution to the conflict, NATO countries at the same time are supplying millions of dollars worth of non-lethal military goods to Ukraine, including body armor, NATO standard helmets, hundreds of thousands of food rations, barbed wire, optics etc. Moscow has previously slammed Washington’s readiness to supply weapons to Ukraine as double standards, with Russian Foreign Minister Sergey Lavrov saying that the West is calling for dialogue between the authorities and the opposition "everywhere in the world," except Ukraine. "Western colleagues say that in Ukraine the most important thing is to support Kiev’s actions,” Lavrov said on Monday. The NATO chief announced on Thursday that the alliance will increase its Response Force in Europe to 30,000 troops, more than double the current 13,000. “Whether the Western states will do it remains to be seen,” he said. As for Washington’s mulling whether to send arms to Ukraine, Pavic believes it is Washington’s goal and it doesn’t need Europe’s support to send arms to Kiev.